Craftin' Caro: NEWSFLASH: 25% off "Wishing You Cheer"
NEWSFLASH: 25% off "Wishing You Cheer"
For a limited time, you can now get the cute little "Wishing You Cheer" 4-piece set through me at 25% off its regular price! Check out the SCS gallery devoted to this set to get inspired with some fabulous ideas. I think it's an adorable set and at this price, how can you go wrong?! This deal is only good until Saturday November 3, so please don't hesitate to call or email me to order yours. All Canadian orders over $50 placed by Wed. Oct 31 qualify for my stampin' Goody Bag deal. 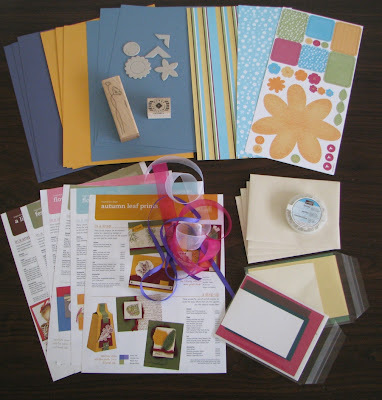 - full sheets of cardstock, envelopes, self-adhesive diecuts, patterned paper, card kits, Inspiration Sheets, ribbons, chipboard, accessories and exclusive hostess-only stamps. Here's an example for you, but please note that each goody package I create is unique & will have different colours, accessories, etc. Just click on the photo if you would like to enlarge it. I had a chance to visit the CreativFestival (formerly known as the Creative Sewing & Needlework festival) and say hi to many of my fellow crafting vendors there. I'll be exhibiting there at the Spring Show in April 08 and think it will be great fun; I know I had a blast when I was working at the 2006 one and met lots of great people there. Right now I'm prepping for next weekend's Hobby Show, where I'll have my annual Stampin' Up! booth. Hope to see some of you there!